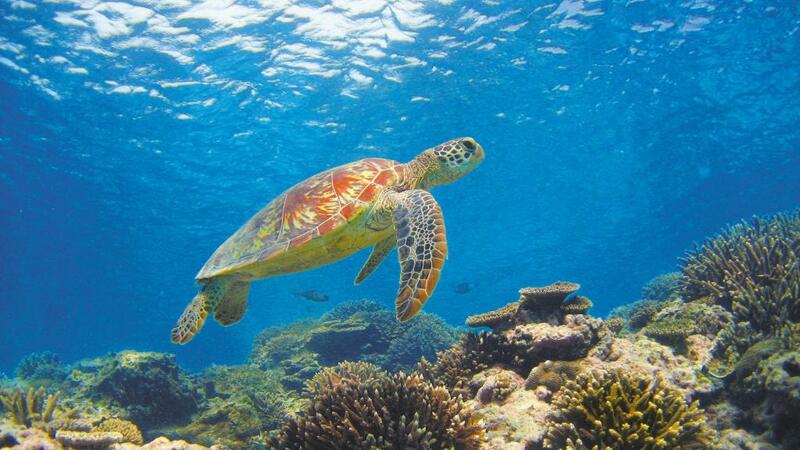 Thousands of Green Sea Turtles have migrated to The Great Barrier Reef for their annual nesting season. Footage released by Christian Miller, showcases hundreds and thousands of sea turtles bobbing off Raine Island, on the outer Great Barrier Reef. Raine Island is home to the world's largest Green Turtle nesting area with around 70 per cent of the world's turtle population traveling there to nest. Turtles can be found at this location all year round, however the warmer months draw thousands more to the island as they prepare to breed. "During the day they are just hanging and relaxing near their preferred nesting beach," said photographer Christian Miller. "When dawn breaks in most of them will start heading towards the beach for a long and exhausting process of getting up above the tide line, digging a deep hole to eventually lay over 100 eggs," he said. During mating season, it can sometimes be a bit of a frenzy, as several males attempt to mate with the same female. The female will keep the sperm of the several different males for use at a later date. The annual turtle migration has become a major attraction for visitors to the Great Barrier Reef, with nesting season occurring from October to march each year. Hatchlings begin to start around early January and last until May. Most of the nesting turtles will make their way up to the shore around high tide of the night, with sunset being the perfect time for visitors to catch a glimpse. Heron Island is another great place to catch the annual turtle hatchings. Famous for its wildlife conservation efforts, Heron Island is passionate about educating its visitors all about the reef and it's wildlife. To learn more about Heron Island's sea turtles, or to plan your next holiday check out the great range of Heron island holiday packages on offer.